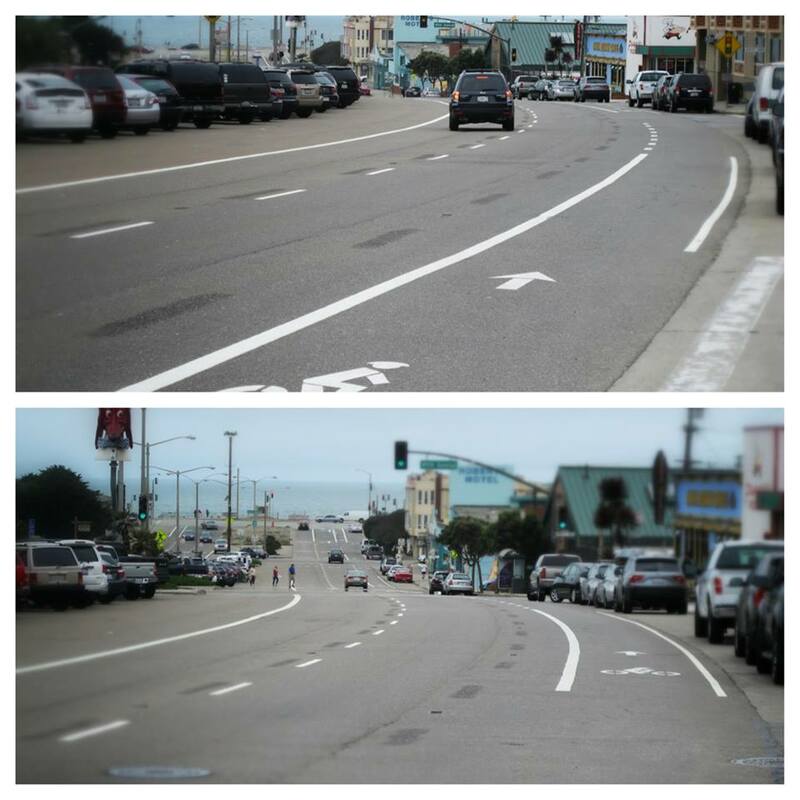 The SFMTA installed bike lanes on outer Sloat Boulevard last week, re-purposing two of the street’s six traffic lanes between the Great Highway and Skyline Boulevard next to the San Francisco Zoo. This one-mile redesign was one of the latter projects to be installed as part of the SF Bike Plan. There’s still a gap between these bike lanes and the buffered bike lanes that run on Sloat between Everglade Drive and 19th Avenue, which were installed in January 2012 by Caltrans. Between Skyline and 19th Avenue, Caltrans has jurisdiction over Sloat because it’s part of Highway 35. Word from SFMTA staffers, however, is that they’re working on a plan with Caltrans to close the gap. With plenty of room for protected bike lanes, there seems to be a major missed opportunity on this stretch. But the Bike Plan was finished in 2005, when the SFMTA wasn’t generally as ambitious as it might be today (though the agency has upgraded a number of other Bike Plan projects since it was approved). coolbaby, there may be conflict on the Panhandle mixed-use path, but it is not any kind of danger to cyclists. Or at least, not any danger to cyclists who obey the huge SLOW sign as the path is entered. The conflict you cite exists only because some cyclists continue to see a recreational mixed-use path as a high-speed commute expressway for bikes. It isn’t. People who breathe also dislike cars because of second-hand exhaust fumes, or the risk of getting crushed to death while walking on the sidewalk because some driver sneezed, lost control, and veered off the road. Just the possibility that it could happen makes walking on certain sidewalks unpleasant (especially those not protected by a line of trees or parked cars). Many articles in the press almost treat people driving cars, riding bicycles, or walking down the street as if we were each different species. For me, the car vs bikes is a false dichotomy. Like 95% of the people out there, and even 70% of the people in San Francisco, I own and drive a car. I plan to continue doing so for as long as I am physically able, which will hopefully be for another 20-30 years. Currently, I typically drive my dog, my laundry, and myself two days a week to and from Berkeley 40 miles away where I live on the weekends. Otherwise I ride my bike and take public transportation most of the time. When it starts raining again, I will probably resume driving the 2.5 miles to the Menlo Park train station and park the car a few blocks away in a residential area for free. I have not driven in the eastern part of San Francisco in probably about 10 years. Most the time I’m going to Yerba Buena, the Ferry Building, the asian art museum, Hayes Valley, the Mission, or near Union Square, all easily accessible by BART and walking. Sometimes I walk a very long way such as between the Glen Park station and the Castro or even the Haight. For the past decade, my driving in SF has been confined to the western part of the city where public transportation is either not available or extremely inefficient if you are going long distances. I would drive to the Legion of Honor, de Young museum, or more often would take my deaf dog to Fort Funston, which is only one a very few places where she can run around. I’ve only driven on Sloat a few times – once to meet a friend from high school that I had not seen in 30 years, once because there was a forced turn due to the closure of the Great Highway, and once looking for gas. Capacity was bad during the forced turn, otherwise Sloat seemed almost deserted. Recently, I’ve begun to explore the city on my bicycle. I heard about the wiggle. and became excited that I could get over to western areas such as Golden Gate park, the museums over there, and my favorite pizza place. I’ve also tried going over the Presidio to Richmond a couple times, but it is a long way. Parts of Richmond and Sunset districts are actually much nicer places to ride a bike than anywhere near downtown or the freeways. So, for the record, I don’t hate cars or think all drivers are murderers. Nor do I think that all bicyclist are irresponsible with little regard for the law. Cars have been around for a century, and bicycles for longer. it’s unrealistic to believe either cars or bicycles will be going away any time in the next century. In places that are crowded, we have to learn to share the space. My own preference is for fast moving cars to be separated from more vulnerable bicyclist and pedestrians. It’s important to have more options to get around, and infrastructure is the key. I didn’t say it was a danger. It’s just too small a path for the amount of use it gets both for recreation and as a fast-growing transportation corridor. I have been to Bruges actually, you’re right, it’s a charming medieval city (town, by our modern standards) so it’s built for walking and horses. San Francisco is not a medieval city, it was mostly built for streetcars and walking, and bicycles. That’s why we have a grid system compared to an older city that isn’t planned like Bruges. Most people got around up until after WW2 and even today via transit, bike and walking still make up a huge part of our transit system. I would encourage you to look into our city’s history a little more as you tend to take many things for granted. Andy, nobody accused anyone of being a murderer. Just to make sure we have accurate info, 70 percent of people in San Francisco don’t own a car — the stat is that 70 percent of households have at least one car (more precisely, 69.7 percent) [PDF]. But 40.8 percent of households have only one car, and several people occupying the average household, so the actual share of people with cars could be in the minority. In fact, even when we take into account households with two cars — another 21.2 percent — we’re left with only 7.7 percent of households that have 3 cars or more. Unfortunately, we don’t have data on the per-person level, but that gives us some sense. Other than Bruges, where are these places in Europe that have few cars and streets free of car parking? Amsterdam maybe? I haven’t been to London or Paris in a while, but recall many cars both moving and parked in several trips there in the past 25 years. A lot of it depends on how much damage (and rebuilding) happened after WW2. But most cities, including London and Paris have areas that are free of car parking. I’m less familiar with those cities than Spanish and German cities where I’ve lived, but for example, in the Spanish Basque Country all the provincial (county) capital cities (from 200-500K inhabitants) have extensive multi-street car-free to car-light zones that add up to several miles of streets. They often use remote controlled bollards that open to transit/taxi/emergency/residential vehicles and close off the street to all other traffic. They have special delivery times as well, and despite many peoples claims, they don’t just hide all the cars underground, they simply don’t need as many. It wasn’t always like that either, under Franco in the 60’s and 70’s just about everything was modified to allow cars in, it was astonishing for me to see old pictures of important commercial and social car-free districts with cars everywhere. Since the end of the dictatorship, they’ve replaced cars with people and trees. Many of these cities, included Bruges have grown since medieval times so it’s more interesting to look at what goes on in new neighborhoods I would say. Usually cars are allowed, but space is made for people and transit as well. Obviously there’s a lot to be said here, but people and transit friendly streets in Europe are the norm, not the exception. Zermatt, Switzerland is car-free and, I believe, never had cars. The center of Leicester, England is getting that way. Much of Venice and some of Amsterdam. Dubrovnik, maybe, but I haven’t been there in a long time. A couple of the Channel Islands, I believe. I can’t speak for the hundreds of cities in Europe I haven’t visited. Thanks for the clarification Aaron. It would be interesting to see how many people who live in San Francisco have a driver’s license. Even in the households with only one car, my guess is that more than one adult in the household will drive the one car or at least be a passenger part of the time. I do have a friend who didn’t learn to drive until she left San Francisco at the age of 30. However, if people with cars are the minority in SF, there’s a whole lot of cars out there! As if people who drive don’t breathe or walk. You talk as if people who walk don’t ever use other modes. Let’s see how you feel about that statement next time you’re riding through there at low speed and one of the Haight St kids’ untrained dogs makes an off-leash run for your tires. My statement wasn’t that complicated. All people deserve to breathe relatively clean air. Criticism of this sub-par bike infra is totally legit, Andy. @Neil – I’m not sure which city you’re referring to, but San Francisco was designed and predicated on streetcar ridership. I’m also not sure which city you think needs more parking, but sanity would suggest it’s one that isn’t one that’s 47 square miles bounded on 3 sides by water and on the 4th side by mountains. SF DPW needs to stop painting road strips while drunk and high. If I were to drive down a street and make the same movements as what is currently being painted on the streets but the strips were NOT there, I would be pulled over for either reckless driving.